This is an extremely scare pot from the 1880 - 90s. 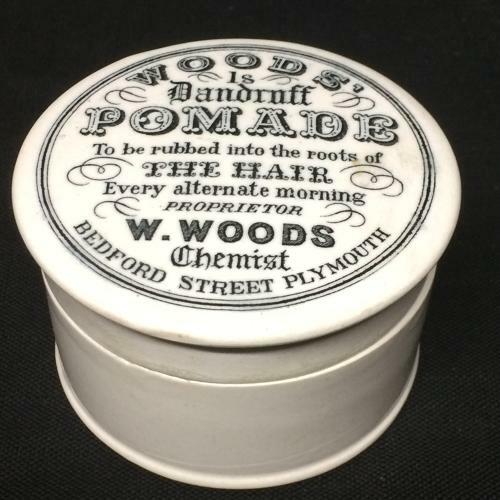 The pot held a rather a strange ingredient for hair pomade. The fatty marrow from cows was mixed with perfumes and marketed in this attractive container. The pomade was supposed to invigorate, strengthen nourish and beautify hair, prevent baldness AND turn grey hair back to its natural color. the ultimate in luxury quack cosmetic cures. The pot base measures 3 3/8” in diameter and stands 1 7/8” tall. The pieces are in great condition with a small area of staining to the base and a couple of fleabite chips to the base. Top is as good as they get. A real find for pot lid collectors and advertising transferware collectors.